In "Developing a Pasture Rotation Plan: Part 1," I shared what I've learned about pasture rotation. Each method has a different focus--forage health, animal health, or soil health--but similar strategies. All limit grazing time according to the condition of the forage and allow for a period of rest. The challenge is trying to figure out how to adapt the particulars to our property. The simplest rotation strategy is to leave stock out in the field and just move them (and their water) to the adjacent paddock. That's how it's done with beef cattle, but dairy animals must be brought back to the barn for milking. 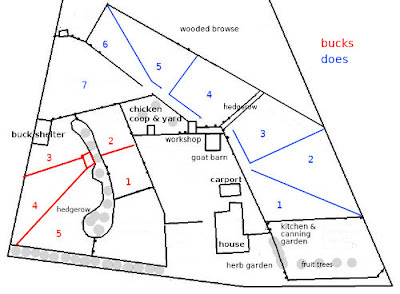 For that, the best plan would be a centrally located barn with grazing paddocks extending from it like spokes on a wheel. The other option is to use lanes or corridors. We've just begun a specific plan to improve the soil in our pastures and the forage along with it. As that improves, we should be able to have a number of smaller paddocks, all with good grazing. Since we aren't there yet, larger but simple seemed like the best way to start. First step toward better grazing rotation. 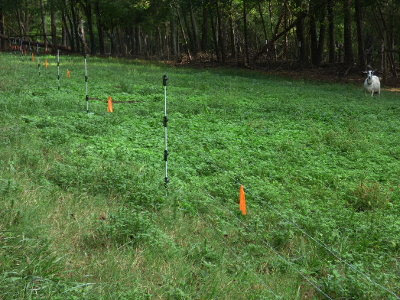 We subdivided our pastures with electric fencing. Three strands, the top exactly nose height for adult Kinder goats. Some people say goats can't be contained with electric fence, and I'm sure for some goats that's true. Especially those inclined to jump. They do have to be trained to it, and we had a couple of break-throughs initially. After a zap or two on the nose they steer clear of those wires. As forage improves we plan to break it down to smaller paddocks. My goal is to give them about four days in each. That would allow for a minimum three-week rest for the forage, more if possible. Proposed, but subject to change. This plan uses corridors for the doe rotations (in blue in the diagram above). That will require gates that can be hot wired to maintain a complete electrical circuit from a centrally located solar charger. 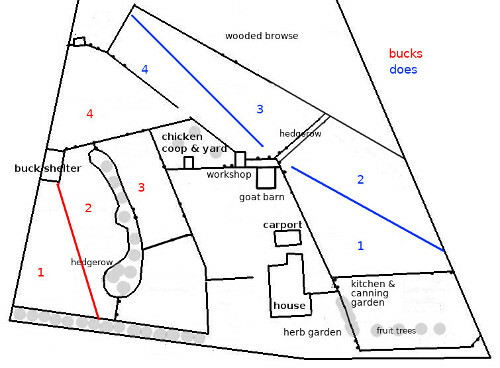 For the bucks (red lines), it made more sense to relocate their shelter to a more central position. That's another building project, but makes for a less complicated set-up for the fences. Plus, having them closer to the house also makes it easier to bring them water, feed, and hay. None of this is written in stone, but with a plan we have something to take steps toward. If we run into obstacles or it doesn't work out as we hoped, we re-evaluate and adjust. This design looks awesome. I am glad you said nothing is written in stone though. One of the first things we found out was you need to be flexible. The pastures respond to more than just grazing. Rain and or drought impact any system. We ran into a need for grazing the young, weaned steers and the yearling heifer away from the two milk cows and the calves they are feeding. Your plans gave me some new ideas, thank you. Fiona, thanks! The people who seem to have the best results in terms of forage and soil health are the most flexible. 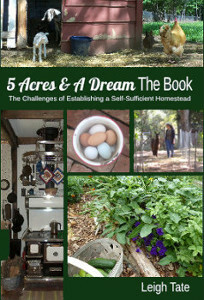 It involves true participation with the land on the part of the farmer. 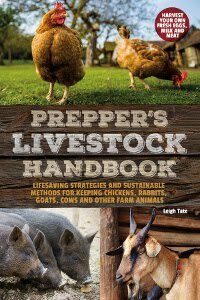 Have you read Joel Salatin's Salad Bar Beef? Lots of excellent information and management strategies, especially for cattle. I like the well thought out near term and long term plans. More people need to do that! It sounds to me as if hogs are similar to goats. There isn't an electric fence that will stop a determined pig but once they get trained, they will come within an inch but never touch it. Once I moved a mama saw and her piglets to a new paddock and mama had it in her mind she wanted to be in the old one. She would start squealing before she even reached the fence because she knew she would be shocked but that didn't deter her. I tried two or three times to move her without success. I finally got a garden hose and made a "waller" for her and that finally changed her mind. How much rain versus irrigation do you have to do in a "normal" year? TB, I think we get a rainfall average of something like 50 inches per year, which ought to be plenty! It's sporadic, however, so when we have a long hot, dry spell, things dry up. Our sandy topsoil is so poor that we can't retain the moisture. It's only been since I've been watching those Gabe Brown and Ray Archuleta videos that I've understand why that's happening and what to do about it. Hence my soil building plan of which grazing rotation is a major part.